Our second “Fork ‘n Cork 2014” adventure took us to the remote Buchner Estate in the mountains outside of Booneville to enjoy good food, some time with friends and explore wines in the Anderson Valley, the heart of California’s Mendocino County. Described in a 2013 Wine Spectator article as the “New Frontier of Pinot Noir”, the region has managed through economic difficulties, a forest fire and obscurity to remain a wonderful terroir for the production of pinot noir, chardonnay, gewürztraminer, Riesling and others. Two of the valley’s top rated pinot noir producing wineries listed in the 2013 article, Londers and Breggo, are no longer in business. So, these three days will be about exploring new and established small production wineries that represent the diversity and spirit of the region. Upon my friend’s recommendation, we drove directly from San Francisco to Foresight Wines, located on CA128 at the south entrance to Booneville. Some good history with another winery sourcing grapes from their Charles Vineyard and the intrigue of a small vintner with long local lineage drew us to Foresight. 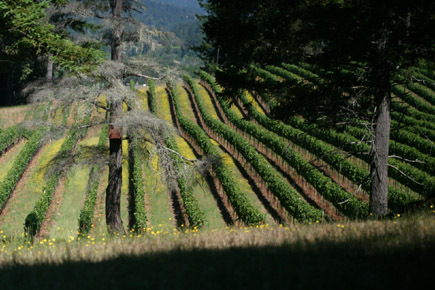 Bill and Nancy Charles made their mark in the Anderson Valley through lumber and construction before establishing the 15 acre Charles Vineyard in 2000, sourcing grapes to other vineyards with their first vintage in 2006. Today, daughter Kristi Charles and husband Joseph Webb work together to produce small lots of pinot noir, sauvignon blanc and, to my delight, Semillon from their estate vineyard. The tasting began with the bone-dry 2011 Foresight Charles Vineyard Sauvignon Blanc ($20), from 100% stainless steel tanks with full malolactic fermentation, more indicative of the New Zealand style wines with a lively acidity and hints of citrus and lemongrass. Rare to the Anderson Valley, Semillon is one of the three approved white grapes in the Bordeaux region of France where it is most often blended with Sauvignon Blanc. Also fairly abundant in Australia, I enjoy the soft “stone” that it typically conveys. 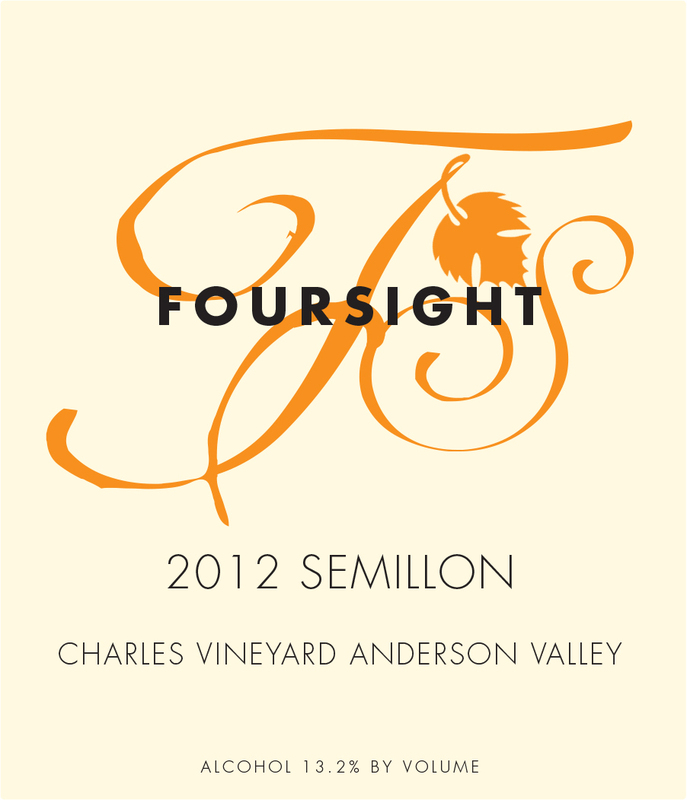 The 2012 Foresight Charles Vineyard Semillon ($20) leads with a mineral nose and ends with a creamy texture and nice acidity. Unfiltered, fermented mostly in stainless steel, this wine lives up to its 90-pt ratings and was a perfect pair with the shrimp and scallop dish we serve the following evening. 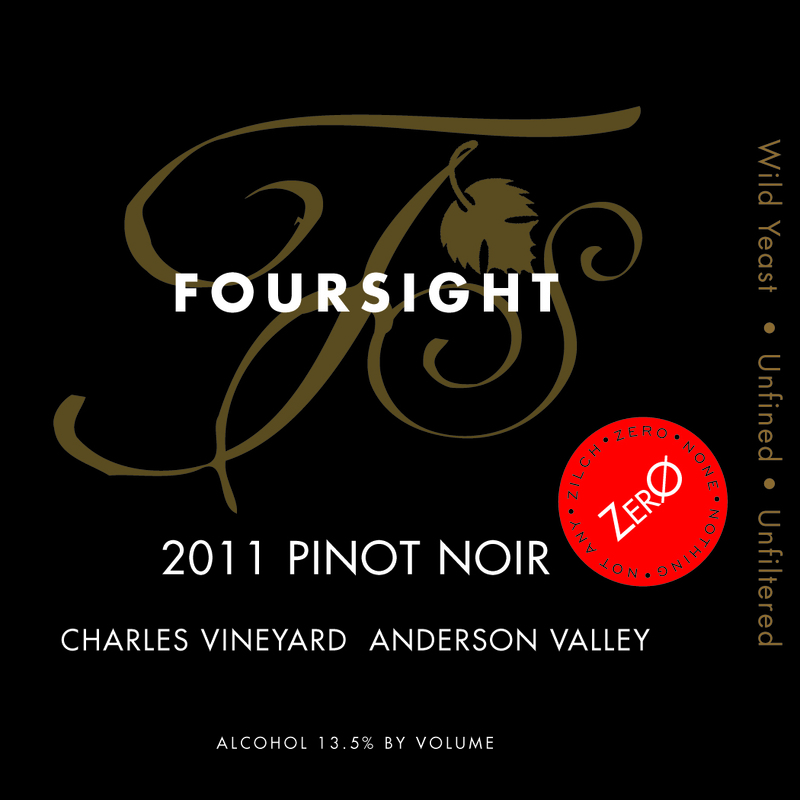 Foresight “Zero” Charles Vineyard Pinot Noir ($38) uses only oak barrels that are at least two years old, resulting in a wine with a vibrant fruity nose with matching flavors of cherries and dark berries. 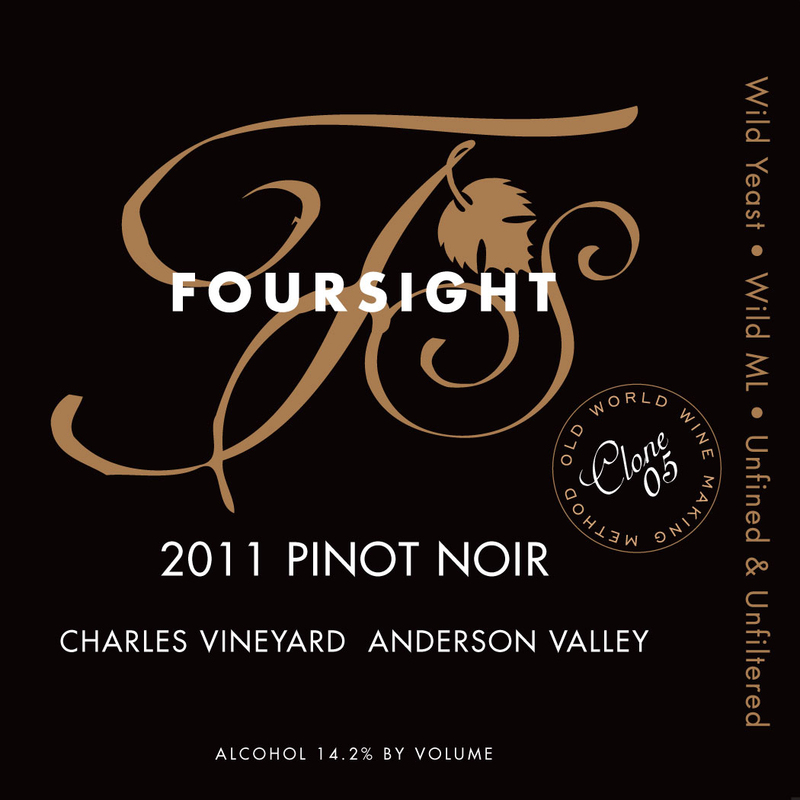 Billed as their house-style pinot, the 2011 Foresight Charles Vineyard Pinot Noir ($46) is a blend of grapes from the vineyard’s four clones. Apparently, 2011 was an exceptionally cold year in the Anderson Valley giving advantage to those easterly vineyards, like Charles, that can still pick fully ripened grapes before the Fall rains. This result is a well-balanced wine with soft spice on the finish. Catering to the need of the “heartbreak grape” to balance both hot and cold, the Anderson Valley offers unique opportunities and challenges to those seeking the perfect pinot noir. It has the largest temperature change, day to night, of any wine-growing region in the world, as high as 50 degrees. Any native knows that the middle of California’s far north gets extremely hot during the summer while the coast is encased in fog. The altitude and the welcome coastal breezes combine, with proper care, push it closer to perfection. The best pinot noir that I tasted on this trip was the 2011 Foresight Clone 05 Charles Vineyard Pinot Noir ($48), 100% Pommard Clone with extended maceration and aged in two-thirds new French oak. The family has learned that this quality clone, in this terroir, does exceptionally well with new French oak. Pinot noir flavors are distinct, but texture and balance of this wine have resulted in well-deserved ratings in the nineties. A few library wines and a barrel tasting concluded a very informative experience and great new discovery. Among the older wines, the 2009 vintage Charles Vineyard Pinot Noir ($49) was noteworthy with strong hints of star anise (licorice) on the nose and palate. The barrel tasting revealed something special with local history involved. The well-known Londers Winery, no longer producing wine, created a popular pinot noir they called “Paraboll”, a wine that Joe Webb worked on. He is now crafting his own “Paraboll” to honor the Londers wine and, if the young juice in the barrel is any indication, the 2014 Foresight Charles Vineyard “Paraboll” would be something to buy futures in. In fact, I was impressed with detailed approach to winemaking, surely foresight that will lead to long-term, sustainable success. The Toulouse Winery began as a retirement venture for Vern and Maxine Boltz when they purchased, in 1997, a 160-acre parcel near the town of Philo. Today, they farm 320 acres of sustainable vineyards in a terroir that is ideal for pinot noir, but I was also searching for some little known white varietals that also thrive in this climate. In lieu of typical crackers, our host at Toulouse dispensed fennel seeds to prepare and cleanse our palates before tasting each wine. Fennel seeds have a licorice, anise flavor that can also compliment the wine. 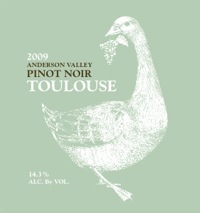 Serving tasty dried cherries, spiced with sassafras and star anise with the 2010 Toulouse Anderson Valley Pinot Noir was also a clever idea. They complimented the earthy rhubarb and cola flavors of the wine in decadent fashion. Our initial tasting was a very crisp, nicely astringent blend of Riesling (30%) and pinot gris (70%), balanced and flavorful at a low price. I found the 2011 Lautrec “Can-Can” White Table Wine ($12) to my liking with hints of grapefruit throughout a nice finish. A good quality food wine at this price is difficult to pass up. Valley. 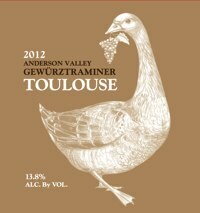 The 2012 Toulouse Gewürztraminer ($24) is a cool climate white wine, sourcing grapes from nearby vineyards and produced in an Alsatian-style, dry and aromatic. It is very floral, with honeysuckle, jasmine followed by nice hints of citrus, stone and tropical fruits. Our group was also impressed with the pale; pink Toulouse Rose’ of Pinot Noir, a dry wine,expressing melon on the bouquet with nice strawberry essence throughout. Of course, we could not leave without tasting the 2008 Lautrec Pinot Noir, their very drinkable fire damaged release with “everything smoky.” Serve it with BBQ ribs right off the grill and see when happens. As I was leaving, a woman stopped and invited me to taste their 2010 Toulouse Riesling Estate ($24) that became one of the most notable wines of the trip. Reminding me of Riesling from the Spatlese appellation in Germany, the wine expressed soft floral bouquet and a nice mouth-feel with stone fruits, pineapple and spice flavors, balanced and dry. 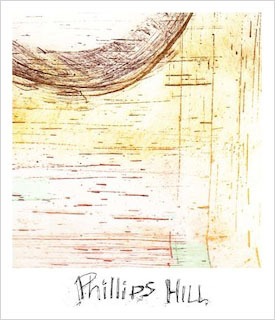 Our third boutique winery, Phillips Hill, started making wine in 2002, producing less than 1,500 cases annually. Aside from their nice wines, I appreciate the effort it took to create an olfactory “smell” room to assist people in identifying typical bouquets and flavor in wine. austere, but fruit forward release with hints of apple and grapefruit that converted a few of our members to the varietal. appellations or “two terroirs.” The 2011 Phillips Hill “Two Terroirs” Pinot Noir ($40) was the big, earthy wine of the flight, with healthy tannins, spice on the finish and a prosperous future. Noir ($45) expressed the complexities and rich texture throughout and were both exceptional wines. Because of stories of a superb 2012 vintage in the vineyards surrounding Elk, Ca, I chose the younger Valenti Vineyard release that is already showing forward fruit flavors of pomegranate and strawberry along with full spice on the finish. One can only imagine what a few more months in the bottle can bring. Two hours north of San Francisco, Booneville and the Anderson Valley deliver a slower, more remote lifestyle to relax and also discover emerging, innovative wine makers producing unique wines of high quality. The people are friendly, the stories are abundant and the stars exploding in the night sky is worth the effort to get there. 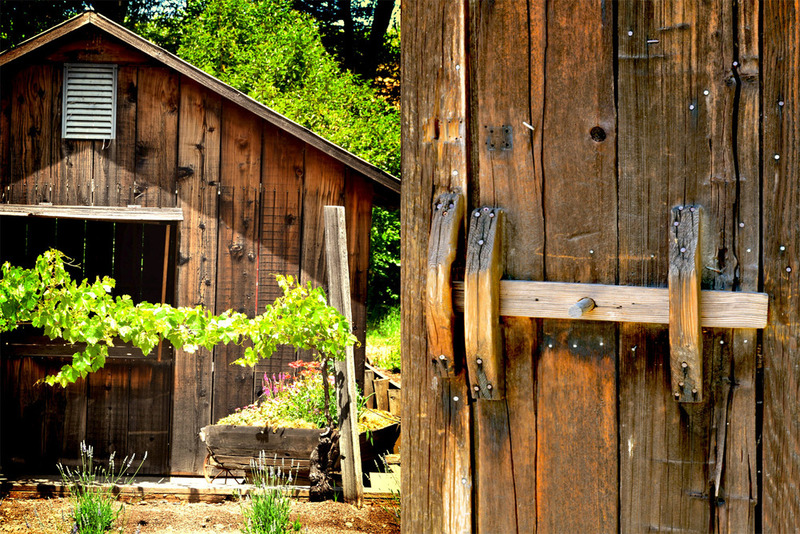 Our second “Fork ‘n Cork 2014” adventure took us to the remote Buchner Estate in the mountains outside of Booneville to enjoy good food, sometime with friends and explore wines in the Anderson Valley, the heart of California’s Mendocino County. Described in a 2013 Wine Spectator article as the “New Frontier of Pinot Noir”, the region has managed through economic difficulties, a forest fire and obscurity to remain a wonderful terroir for the production of pinot noir, chardonnay, gewürztraminer, Riesling and others. Upon my friend’s recommendation, we drove directly from San Francisco to Foresight Wines, located on 128 at the south entrance to Booneville. Some good history with another winery sourcing grapes from their Charles Vineyard and the intrigue of a small boutique with long local lineage drew us to Foresight. The barrel tasting revealed something special with local history involved. The well-known Londers Winery, no longer producing wine, created a popular pinot noir they called “Parabol”, a wine that Joe Webb worked on. He is now crafting his own “Parabol” to honor the Londers wine and, if the young juice in the barrel is any indication, the 2014 Foresight Charles Vineyard “Parabol” would be something to buy futures in. In fact, I was impressed with detailed approach to winemaking, surely foresight that will lead to long-term, sustainable success. In lieu of typical crackers, our host at Toulouse dispensed fennel seeds to prepare and cleanse our palates prior to tasting each wine. Fennel seeds have a licorice, anise flavor that can also compliment the wine. Serving tasty dried cherries with sassafras and star anise with the 2010 Toulouse Anderson Valley Pinot Noir was also a clever idea. They complimented the earthy rhubarb and cola flavors of the wine in decadent fashion. 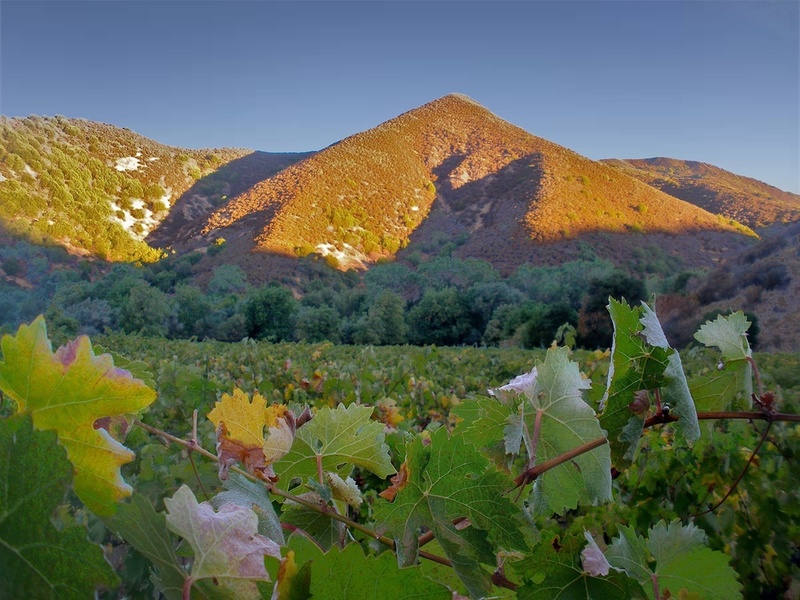 In my subtle pursuit of unique CA white varietals, I have learned that much of the state’s best Gewurztraminer comes from the Anderson Valley. The 2012 Toulouse Gewurztraminer ($24) is a cool climate white wine, sourcing grapes from nearby vineyards and produced in an Alsatian-style, dry and aromatic. It is very floral, with honeysuckle, jasmine followed by nice hints of citrus, stone and tropical fruits. 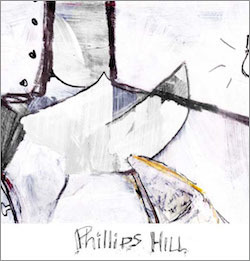 Our third boutique winery, Phillips Hill, started making wine in 2002, producing less than 1,500 cases annually. Aside from their nice wines, I appreciate the effort it took to create an olfactory “smell” room to assist people in identifying typical bouquet in wine. In an “old barn” setting, the tasting started with the 2013 Phillips Hill Chardonnay “Ridley Vineyard” ($30) with a nice mineral element to balance the stone fruits. However, the white wine that stood out was the 2013 Phillips Hill Gewurztraminer ($20) an austere, but fruit forward release with hints of apple and grapefruit that converted a few of our members to the varietal. We soon moved from whites to tasting a flight of the four current pinot noir releases. I recommend all of them, including 2011 Phillips Hill “Boontling” Pinot Noir ($25), named for the local jargon and utilizing grapes from various valley vineyards to create classic pinot aroma and taste. Although the Cerise and Ridley Vineyards are both in the Anderson Valley, they represent two distinct AVA designated appellations or “two terroirs.” The 2011 Phillips Hill “Two Terroirs” Pinot Noir ($40) was the big, earthy wine of the flight, with healthy tannins, spice on the finish and a prosperous future. The final wines were single-vineyard releases, one from Elk, CA and the other from Comptche, five miles inland from the Pacific Ocean. 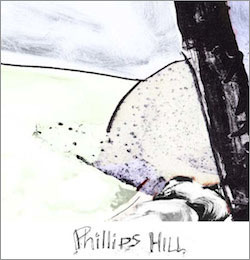 Both the 2011 Phillips Hill Oppenlander Vineyard Pinot Noir ($40) and the 2012 Phillips Hill Valenti Vineyard Pinot Noir ($45) expressed the complexities and rich texture throughout and were both exceptional wines. Because of stories of a superb 2012 vintage in the vineyards surrounding Elk, Ca, I chose the younger Valenti Vineyard release that is already showing forward fruit flavors of pomegranate and strawberry along with full spice on the finish. One can only imagine what a few more months in the bottle can bring. Two hours north of San Francisco, Booneville and the Anderson Valley deliver a slower, more remote lifestyle to relax and also discover emerging, innovative winemakers producing unique wines of high quality. The people are friendly, the stories are abundant and the stars exploding in the night sky is worth the effort to get there. This entry was posted on Thursday, July 17th, 2014 at 12:17 am	and tagged with Booneville, Foresight Wines, Gewürztraminer, Paraboll, Phillips Hill Winery, Pinot Noir, Semillon, Toulouse Winery and posted in Travel, Wine. You can follow any responses to this entry through the RSS 2.0 feed.